I have migrated LVTC to a new domain and software. You can now find LVTC by going to http://blog.coreyganser.com. I have setup a redirect on this site so you will be redirected shortly. I updated my feed so that if you subscribe to LVTC you will still continue to received updates. Enjoy the new site. 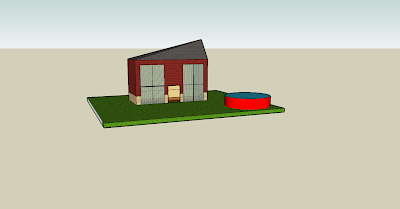 I ran into SketchUp today which is a 3d model software. Really easy to use and a lot of fun to mess around with. Here is a house I did in it in about 4 min. A weekend ago I decided to buy coreyganser.com so that I can have a site to link to from my blog when I do documentation and so that I have a smaller url for my blog. You can now reach my blog by going to http://blog.coreyganser.com. For all you people out there that have diligently entered livingvicariouslythroughcorey.blogspot.com, thank you for your persistence and support. Nothing will change with the blogs content except that I may make it shorter and reference info on my main site coreyganser.com, which btw is running Mindtouch Deki Wiki. This was a sweet weekend to play catchup. I completed a big project of transfering 10 Mini DV tapes to DVD. I documented it on my new wiki that is under construction right now(ignore the background for now...still messing around with it :) ). Pam and I drove around a bit too and went to the beach...it was a good relaxing weekend. Ready to jump back into work. Have you ever wanted to see if people were mentioning your product or company on twitter but don't have time to run tweetscan every hour. Use Summize. Summize is a very easy to use Twitter search engine that kicks out an RSS feed so that you can receive notificaitons anytime someone mentions anything that matches your search. This was rrecently integrated as part of Get Satisfied which ties in this component to your company profile to be site that focuses on the Customer Service aspect of the company.